A donor-funded clinic in northwestern Thailand is helping save the lives of underweight babies born to impoverished Burmese mothers who have crossed the border to seek help. In 2012, the clinic delivered a record 3,500 Burmese babies and had at least 5,000 Burmese antenatal care visits. Neonatal equipment such as an infant warmer were donated to the clinic last year when it saw more than 1,000 neonatal admissions, a 60 percent jump from 2011. "Now we can save more babies' lives," said Cynthia Maung who set up the Mae Tao clinic in 1989. She admits the congested clinic struggles to meet demand, and frequently pays for patient referrals at Thai hospitals. According to a 2013 UN Children's Fund (UNICEF) report, almost 10 percent of newborns in Myanmar had a low birth weight, which is often caused by malnutrition, malaria, anaemia and prematurity. Around 56,000 children in Myanmar die before they reach five every year. Mothers who recently gave birth at the clinic said they crossed the border to obtain better treatment than they can get in Myanmar. A few days after giving birth to preterm twins, Nin Moe Aye was exhausted and worried. "I'm concerned about my two babies," the 35-year-old mother from Bago Province, near Yangon, told IRIN. "I wonder if they will be fully developed when they grow up." At 1.5kg each, her tiny newborns were placed in the clinic's infant warmer to improve their survival chances. 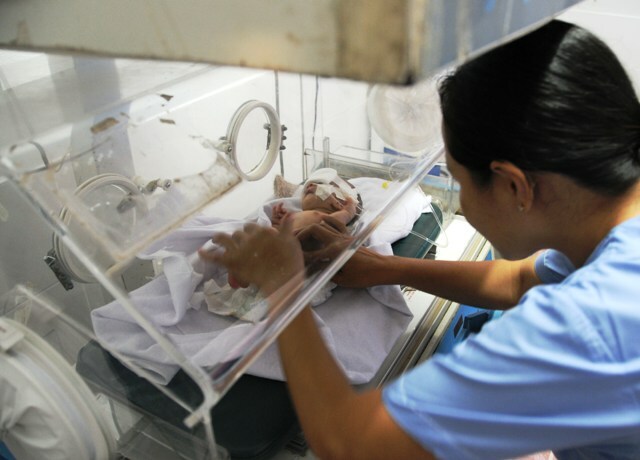 Low birth weight babies under 2.5kg are one of the leading causes of infant deaths. Myanmar's infant mortality rate is 48 per 1,000 live births while the mortality rate for children under five is 62 per 1,000 live births, both of which are the highest in Southeast Asia, the UNICEF report says. As part of the country's Millennium Development Goals (MDGs), Burmese officials aim to cut these rates to 33 and 43, respectively, by 2015. To do this, health experts stress that proper care is paramount in the early days of a child's life. "While the right to adequate health care across Myanmar is improving, infant mortality remains concerning with the highest proportion of under-five deaths during infancy," said Maharajan Muthu, officer-in-charge of UNICEF's young child survival development efforts in Myanmar. Almost three-quarters of under-five deaths occur before the child's first birthday. Of these, around 90 percent are neonatal deaths (within the first 28 days of life), with many having treatable illnesses such as diarrhoea and pneumonia. "There is a need for appropriate context-specific policy and programmatic responses," said Muthu, explaining that national coverage of postnatal home visits remains low and there is no official written policy on the treatment of pneumonia and diarrhoea by health volunteers. In 2013, just over 3 percent of Myanmar's budget was earmarked for health, compared to more than 20 percent for defence. Although foreign donors are trying to bolster the nation's healthcare system, many patients pay their own medical bills. More than 90 percent of total health spending is by private patients in a country where the average person earns less than US$1,200 a year. "Public expenditure on health in Myanmar has been very low for many years," said Philip Carroll, spokesperson for Save the Children. "This has led to a situation where health infrastructure has deteriorated and there is a lack of a sufficient health care workforce, including midwives and other health care workers capable of providing skilled birth attendance." Better access for midwives to remote rural areas could reduce infant mortality, he added. Health experts also warn that scarce health education is compounding the issue, particularly in border areas where decades-long fighting between ethnic rebels and the Burmese military has left many communities neglected. In parts of eastern Myanmar, the infant mortality rate is 73 deaths per 1,000 live births, compared with 11 in neighbouring Thailand. In 2005, the Mae Tao clinic and other health groups began the Mobile Obstetrics Medics (MOM) project to expand child and maternal care in hard-to-reach areas, but health workers are still stretched thin. On average, midwives can cover up to 16 villages and work more than 10 miles away from their respective township departments. Furthermore, only 132 townships out of 332 were given training and services by the Department of Health from 2001 to 2012 to treat emergency obstetric and newborn cases, say World Health Organization officials. Without sufficient access to care, expectant mothers will continue to follow Nin Moe Aye's well-beaten path across the border. "I would have had more difficulties if I didn't come here," she said of the free clinic. "I don't think my babies would have survived."